Blackwater Creek Gold-N Professional Diet Koi Food combines ingredients with many micro nutrients and vitamins as well as other ingredients to help digestion and maximum uptake of nutrients. This floating Koi food is a favorite of those keeping champion and show-grade fish. 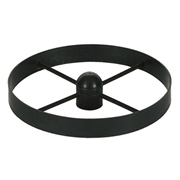 It is used by professionals world wide. Blackwater Creek also uses it as a grind to feed small fish for fast growth and body shape. This diet if fortified with probiotics including Bacillus Subtillus and Aspirgillus Orezae in sufficient quantities to maximize digestion and minimize waste. Fish-meal, Shrimp Meal, Kelp Meal make up over 60% of the diet. No fillers, better digestion. This is why so many hobbyists are discovering that you don’t have to pay a lot to provide your fish with the top diet available for Koi. Many people who have not taken the time or have the time to dig deep into Koi nutrition may judge a Koi food on price alone. This perception that "if it costs more , then it must be better" allows some people selling fish food as Koi food to charge a high price for an inferior product. (Tilapia food , Catfish food etc) These are not the best for your fish. 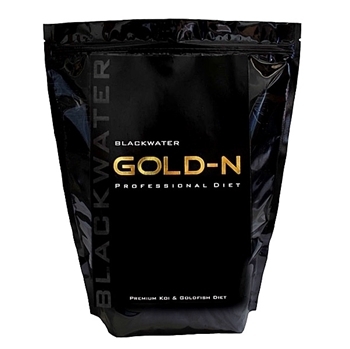 Blackwater Gold-N is. Therefore if you would like to pay more for a diet to help you feel better about quality, we have listed Gold-N with various prices for you to choose from. Its the same diet, same packaging, and same size... just at a higher price to compare with the other diets claiming to be professional. If it makes you feel better, you can pay more... we don’t mind (grin).